The original Dressel School was brought back into the school district in 2011. The building was then demolished in 2015 to make way for the new Dressel School. It was dedicated in a ribbon cutting ceremony on Wednesday, August 2 followed by an open house from 4:30 to 6:30 that was open to the public. The original plaque for the dedication of the first Dressel School was stored in the SCHS archives for many years. The Society has given the plaque to Lindbergh Schools and it will be placed in the new Dressel School in the main meeting room. This Lindbergh Schools webpage includes a slideshow of the new Dresse School. Below is the Lindbergh School invitation to the public to attend the Dressel School open house on August 2, 2017. 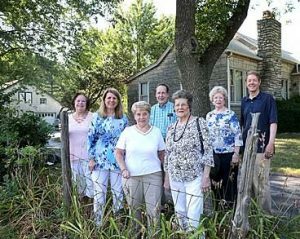 The Sappington-Concord Historical Society is featured this morning on the front page of the South County Times. It is in conjunction with the opening of the new Dressel School next Wednesday, the SCHS 25 anniversary and the new SCHS Ross A Wagner History Center. The paper is on your driveway in the red wrapper. Or see it on-line at: http://tinyurl.com/ycxyzsfl Of related interest is the President’s message. The people in the photo are all current board members. The photo was taken by Ursule Ruhl at the new Ross A Wagner History Center. Please note that the Wagner Center is not open to the public at this time. In the foreground of the photo is one of the fences on Ross’ farm. The cedar fence posts are said to have been installed during World War II by German prisoners of war. Ross’ house is in the background. Currently plans are under way for the maintenance and development of the property with an eye toward maintaining the legacy of Ross Wager as both an historian and a farmer. If you would like to offer time, dollars, or your special skills to this effort, contact Stephen Hanpeter at schs.webmanager@gmail.com. 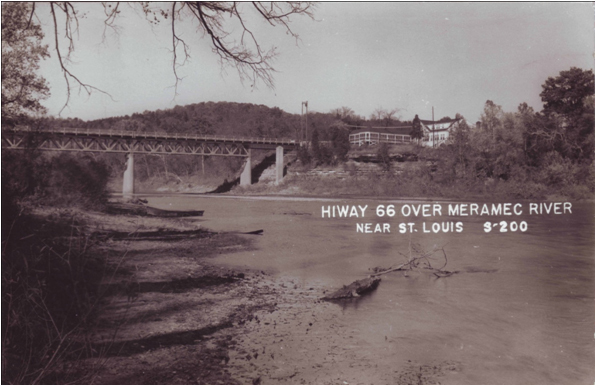 HELP US SAVE THE ROUTE 66 MERAMEC RIVER BRIDGE! 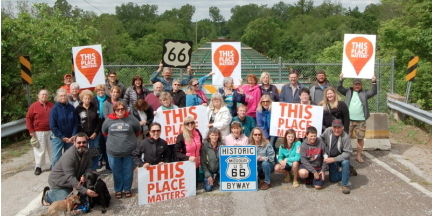 The campaign to save the Route 66 Meramec River Bridge. The appeal below is from Ruth Keenoy of the Landmarks Association of St. Louis. Route 66 is one of the most iconic roads in the world and we are lucky in Missouri to have the Route 66 State Park, which holds the Route 66 Meramec River (Times Beach) Bridge, constructed in 1931-32. The bridge is one of the most visited stops along the nation’s entire Route 66 corridor. The bridge has a Warren deck truss, which is a rare property type in Missouri. The state has only three (including the Route 66 bridge) examples left. The bridge is on the National Register of Historic Places. In 2009 the bridge was closed and the following year, 2010, was listed on Missouri’s statewide list of endangered historic places. In January 2016, Missouri State Parks agreed to take over ownership of the bridge but requires an endowment to help fund the bridge’s preservation and rehabilitation as a bicycle / pedestrian crossing. If we cannot raise $575,000 by the end of 2016 to support this effort, the bridge will be demolished in early 2017. We Need Your Help! Please contribute today by checking out our GoFundMe campaign at: https://www.gofundme.com/meramec-66-bridge or make a donation by mailing a check to Landmarks Association of St. Louis (fiscal agent for the bridge), 911 Washington Avenue, Suite 170, St. Louis, MO 63101. We accept pledges from major donors. For more information, contact Ruth Keenoy at 314-637-6441 (ruthkeenoy@yahoo.com). All contributions are tax-deductible. The extended text below is also from Ruth Keenoy of the Landmarks Association of St. Louis. Route 66 is one of the most iconic roads in the world. The “Mother Road,” as it is called, was one of the first of America’s new highways that proliferated in the 1920s. It was purportedly the shortest direct route from the Great Lakes to the Pacific Coast. Although officially decommissioned in 1981, the highway continues to draw huge numbers of national and international tourists for its unique sense of history and place. A conservative total aggregate of money spent by all Route 66 tourists is about $38 million annually. In addition to the $38 million in tourism spending, it is estimated that there is an additional $67 million in Main Street spending and $27 million in museum spending, making the total annual investment in Route 66 $132 million. All of the states that support Route 66 share in the great economic boon of heritage tourism and the economies that are bolstered along the highway’s path. We are lucky in Missouri to have the Route 66 State Park. Located in St. Louis County, the park boasted an attendance last year of 216,432 – making it one of the most visited stops along the entire Route. Within the park is the Meramec River Route 66 Bridge. Listed on the National Register of Historic Places in 2009, the bridge is a rare property type –one of three similarly designed bridges in Missouri, featuring a Warren deck truss fabricated by Stupp Bros. Bridge & Iron Company of St. Louis in 1931. In 2009, the Missouri Department of Transportation (MoDOT) found the bridge deficient. Because the bridge is no longer part of the state’s highway system, it was closed and slated for demolition. A group of stakeholders organized in 2010 to save the bridge from demolition. MoDOT agreed to use part of the funds earmarked for demolition to remove the bridge’s concrete decking, eliminating further damage caused by the heavy surface and buying some time to find a new owner for the bridge. In early 2016, Missouri State Parks agreed to accept ownership of the bridge but in doing so requires an endowment, the $575,000 mentioned above, by the end of 2016 to support this effort, the bridge will be demolished in early 2017. 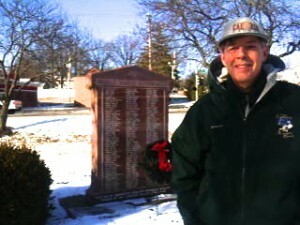 See web page about SCHS presentation by Joe Sonderman on Route 66 in St Louis. Sappington-Concord Memorial Park to get new neighbor! SCHS Annual Memorial Day ceremony, honor guard in front of WWII Honor Roll in Sappington-Concord Memorial Park. As of today, January 13, 2016, Sappington-Concord Memorial Park will have a new neighbor! And the new neighbor, the Lindbergh Schools, is a long time friend. Former Lindbergh Schools Superintendent Dr Jim Sandfort was instrumental in the 1992 founding of the Sappington-Concord Historical Society, SCHS. The SCHS has been with Lindbergh Schools ever since, holding its meetings there and offering support to the Lindbergh Schools and Lindbergh students. 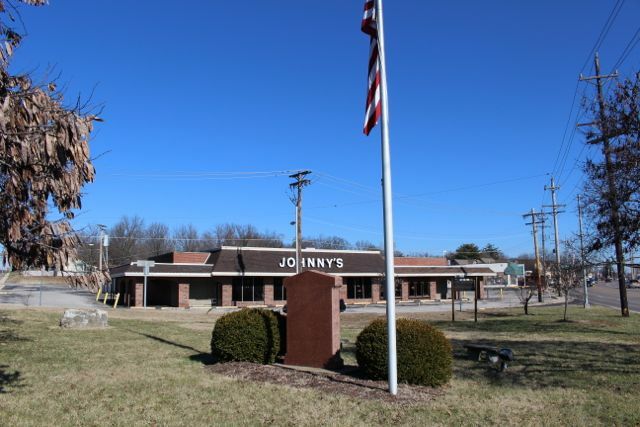 The former Johnny’s Market is across the street, Denny Road, from Sappington-Concord Memorial Park where SCHS has its World War II Honor Roll. The Memorial Park is maintained by Boy Scout Troop 646 of St. Catherine Laboure. Sappington-Concord Memorial Park is destined to be part of the “front yard” for the new Lindbergh Schools central office! See the SunCrest Call newspaper‘s article announcing the purchase of the former Johnny’s Market property by the Lindbergh Schools. See January 14, 2016 South County Times article on the purchase of the former Johnny’s Market property for the new Lindbergh Schools district offices. See January 20, 2016 SunCrest Call article on the planning and construction of the new Lindbergh Schools district offices. Sappington-Concord Memorial Park has been the site of the annual SCHS Memorial Day ceremony sponsored by Sappington-Concord Historical Society since 1995. In 2015, the ceremony was held on the green at St Lucas UCC on Denny Road, a short distance up the hill from the park. The 2016 ceremony will again be held on the green at St Lucas UCC. The Memorial Day ceremony is a community wide event to honor the contributions and sacrifices of our veterans and armed forces to protecting our country. See photos of past SCHS Memorial Day ceremonies.